You will need to make some minor mods to get the cable talking to your knitting machine. Follow the tutorial to get your knitting cable going. The message window should say it found a cable. Now select Read and Parse to read in the cable programming. Click the buttons that say to Invert TX and RX. Here is the wierd thing, you have to Save as… the settings so just save it anywhere. Now you can click the Program button (lightening bolt). The message window will say it programmed. Next we need to rewire the FTDI cable to match the pinout of the knitter. 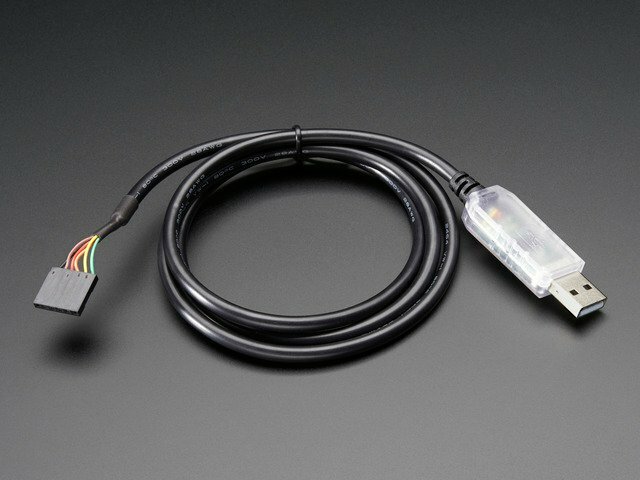 The cable comes with a 1x5 connector, but we need a 2x4 connector. You can also follow Davi Post's excellent rendition of this cable-rewiring section. Use tweezers to lift up the black connector tabs. Then gently pull out the wire. TODO: We're pretty sure its possible to make this part less difficult by using the RTS (green) wire without splicing it to the 5V (red) wire and using setRTS() in the python code but we already mangled the cable before trying this. If you try and succeed, please post up in the forums! In this section we will download and install the software that emulates a disk drive to the knitting machine. We've had good luck running this software on Linux and Mac (OS X) systems, but it supposedly works on Windows now too, thanks to Steve's PDDEmulate.py bug fix. Try it and let us know! Open up a command line (windows) or Terminal (mac) or xterm (linux) and cd to the brother directory and then type in ls (or dir if ls doesnt work) to list all the files. Under Mac, in the Terminal window, type in ls /dev/cu. * which should give the following responses or so. For Linux/Unix type ls /dev/ttyUSB* into a terminal window, you should see a device file called something like ttyUSB0. If you are using Windows, go to the Device Manager (From the Start Menu, select Settings→Control Panel. Double click on System and select the Hardware tab. Then click on the Device Manager button). This step will show how to download the custom patterns from the knitting machine memory to your computer. This is just for the 'custom' patterns, it wont download the 'built in' patterns that are shown in the manual. Plug in the cable into the back of the machine. There is a 'key' on the plug so you should be able to use it without accidentally putting it backwards. Still, check to make sure you have the right colored wires in the right places now, before plugging it in. Now back to the computer. Start up the disk drive emulator in the command line by typing in python PDDemulate-1.0.py img COMPORT where COMPORT is your serial connection. For example on a mac the command might be python PDDemulate-1.0.py img /dev/tty.usbserial-A7TKMHYD this will make an 'image' of the knitting memory in a directory called img. Now over on your knitting machine... When "ready" lamp is lit, clear display with CE key, then prepare to save pattern data to "disk" by typing 552, then STEP. The file-01.dat file contains any pattern data that you entered into the machine by hand. You can use the dumppattern.py software to view patterns and see which patterns are in which slot. Not all information is printed, like memo data, just the stitches. Using it is simple, and you don't need to be connected to the knitting machine to perform this step. Open up that terminal program and navigate to your directory where the software is. Type in python dumppattern.py img/file-01.dat (that's assuming that the folder you chose before is called img). You can view individual patterns by running python dumppattern.py img/file-01.dat PATTNUMBER where PATTNUMBER is the name of the pattern, usually starting with 901 and going up to 999. Now we get to the fun part, showing how you can make an image on your computer and then inserting it into the memory file so that we can easily make new patterns without the tedious entering-by-hand part. The first thing we'll need to do is make the image. The image must be 1-bit/2-color/monochrome/black&white. You need to make sure that whatever image software can save the file in monochrome. A free program on every windows computer that can do this is MS Paint - its crummy but it does this stuff kinda well. A nice thing you can do is zoom in and click pixels. Remember that stitches in knitting are not square, so you may want to squish your graphic horizontally just a bit before lowering its resolution. Again, make sure that its saved as a monochrome 1-bit Bitmap (BMP) file. Next you'll need to figure out the pixel dimensions (width and height). You can count the pixels or, at least under windows and some paint programs, they'll report the image size for you. Write down or otherwise keep track of the pixel dimensions for the next step. Our software can't add new patterns to the memory file (we don't understand enough of the format to do so) but it can edit existing patterns. So what we'll do is make a blank 'container' pattern on the knitting machine. Then we'll edit the pattern on the computer and re-upload the file. In this step, you're going to create the blank "container" pattern of the appropriate dimensions using the knitting machine control panel. This pattern is going to be 32x32 and will have pattern ID #901. Note the pattern number that appears. User-input patterns get assigned a number in ascending order starting at 901. The number of available rows in the machine's memory will appear on the display. Press CE to clear the display. Enter the pattern's height (number of rows) and press STEP. Press INPUT once more to exit input mode. Repeat for as many patterns as you'd like to create (and for which you have space). Now you'll run insertpattern.py by typing in python insertpattern.py img/file-01.dat PATTERNNUM BMPFILE myfile.dat which will insert the BMPFILE You made in part 1 into the pattern # location PATTERNNUM and when done, save the new data file tomyfile.dat (so you dont overwrite the old file). If the pattern size doesn't match the image size it won't continue. Now that we have the myfile.dat, we'll need to split the file into tracks. This lets the emulator load the files back like it was a diskette. We've included a simple program to do this, its called splitfile2trakc.py and you can run it by typing in splitfile2track.py myfile.dat it will create two files, track0.dat and track1.dat. Rename the files 00.dat and 01.dat respectively. And drag them into your img folder. If you're looking for a simple way to accomplish all that file-wrangling, check out Davi Post's img2track software that combines many of the above steps into one handy program. Lastly, we'll reupload the files to the knitting machine, see the next section! This step will show how to upload the custom patterns to the knitting machine memory from your computer. This is just for the 'custom' patterns, it wont overwrite the 'built in' patterns that are shown in the manual (those are built into the "ROM"). When "ready" lamp is lit, reset the machine's memory by pressing CE key, then type in 888, then press STEP key. This deletes all stored patterns, so be sure to back up first if you have patterns on the machine you want to save! (The patterns included with the machine are stored on non-rewritable chips and can never be deleted through this method). Display should go blank, then "ready" and "pattern no" lamps should illuminate. Press 1 to indicate which "track" to load from the disk drive emulator, then press STEP. Machine will beep when finished. Pick a pattern and knit as normal, according to the machine manual for knitting a pattern from memory.